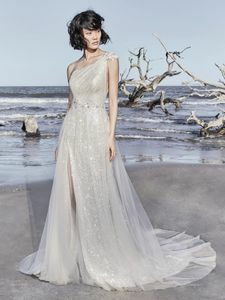 Description: This unique wedding gown evokes Old Hollywood glamour, featuring glittering layers of ethereal tulle. A beaded motif featuring Swarovski Crystals at the one-shoulder neckline drifts into a gorgeous strap detail in the back. A thigh-high slit and attached beaded belt complete the A-line skirt. Lined with a bodysuit for a figure-flattering fit, and finished with zipper closure.